A full five years on from Mordaunt-Short's original Performance 6 floorstander with its radical moulded enclosure, comes its long-promised standmount partner, the Performance 2. Looking every bit as elegant on its matching glass and alloy stand, the Performance 2 shares many of its bigger brother's advanced features, including the rather clever rear aspirated and mechanically decoupled 'ATT' tweeter unit. This two-way design features a bass/mid driver positioned above a flared reflex port and below the tweeter. The advanced '3rd generation' 165mm main driver has Mordaunt- Short's familiar aluminium dish shaped 'continuous profile cone', 120mm in diameter, with a wrap-around edge and little radial ribs towards the periphery to aid stiffening. Developed using the well-regarded Klippel modelling techniques, the variable thickness surround and the spider are adjusted to minimise distortion and the neodymium motor incorporates a shorting coil. Like the tweeter, this unit is mechanically decoupled from the front baffle by a rubber gasket, and is actually mounted onto six rods running forwards from the rear of the 'shell' and incorporated in the moulding. In recent years some of the most important improvements in sound quality have come through careful selection of audiophile-oriented components for use in crossover networks. The damped second-order network used to feed the tweeter here uses a DVP (dual value parallel) capacitor technique, employing high-quality polypropylene examples from ClarityCap. Two matching pairs of custom terminals are mounted on the rear, connected for single wiring by brass strips. Before we get into the nitty-gritty of just what these innovations do to the speakers' overall performance, let's examine the outer shell so to speak. 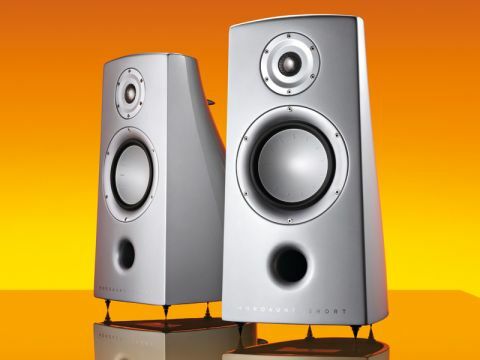 As shiny, high-gloss 'piano black' loudspeakers seem to have become the current fashion with consumers – the Performance 2 is also available in graphite grey and silver (pictured), it was interesting to note that the midnight black samples we reviewed matched the sleek pillar stands (£495 per pair) well. The stands are constructed using glass tops and base plates connected by a shiny black alloy column. The glass itself is toughened furniture-grade, also coloured black, and the base is constructed from a sandwich of glass plates with a constrained damping layer in between. Just a single piece of glass is used for the top plate, topped by a soft and lossy layer which forms a constrained damping layer between the glass plate and the metal base of the speaker itself. No alternative colour options are available for the stand, but the back of the pillar has a slice removed so that cables may be neatly tucked away. The speaker is firmly bolted to the stand, and the base accommodates four proper floor spikes, only mildly compromised by finger-wheel lock-nuts but with a generous footprint. The end result has good physical stability and is probably as heavy as many floorstanders, even though the main shell of the moulded enclosure is deliberately quite light. The moulded enclosure is surely the real pièce de résistance here. 'Wood is not an engineering material', was a key phrase Mordaunt-Short used when launching the original Performance 6, and that remains a key rationale behind the design of this new Performance 2. One obvious advantage of moulding is the ability to create an irregular and exceptionally elegant shape. All surfaces are curved and the whole thing is strongly tapered so that it's slim and very shallow at the top, but slightly wider and considerably deeper down at the base. Curved surfaces are much more rigid than flat ones and the complex curved shape of the Performance 2 is both light in weight (to avoid storing energy) yet exceptionally stiff. Internal reflections are distributed every which way, rather than back through the main driver cone and the lack of any parallel faces ensures that internal standing waves are widely distributed. Strategically placed internal webs provide further stiffening, as does the flat metal baseplate that supports the rest and prevents the whole thing flexing. The LE version of the Performance 6 used a reformulated polymer resin for improved performance and this more recent variation is also used in this model. Grilles are supplied to cover just the bass/mid driver, but their use is discouraged on sound quality grounds. Only a coarse mesh to protect the aluminium dome of the tweeter, is a permanent fixture. So what of the sound? While it's clear that a standmount with just one bass/mid driver will never offer either the bass weight, the power handling or the ultimate loudness capability of a larger multi-driver floorstander, it does have several other advantages. One plus point is the innate simplicity of a two-way, with just one crossover point and a simpler network for the amplifier to drive. Another is that generating all the bass output from well off the floor, and from sources with lots of space around them, does seem to give a rather cleaner, crisper bass than floorstanders manage. Clean, crisp and clear is the most obvious phrase to describe the fundamental characteristics of this stylish loudspeaker. There's actually so little of the usual wooden box colourations going on here that, despite the impressive neutrality indicated by the in-room measurements, the end result seems to lie a little on the cool and clinical side of subjective neutrality. As a result, the Performance 2 seems to work best when driven by sources and amplification with relatively warm characteristics, and which, therefore, provide some balancing compensation. Although it worked fine with our normal solid- state Naim NAC552/NAP500 combo, it also seems very well suited to being driven by valve amps, including our restored Leak Stereo 20, and a pair of single-ended PX-4 triode based monoblocks fed from a Quicksilver Audio Full preamplifier. By the same token, it seems to prefer the warmth of vinyl to the cooler character of CD, for example, and we got particularly impressive results when we spun the Grateful Dead's classic late-1960s album Anthem of the Sun. Although the Performance 2 does tend to sound rather lean and short of ultimate weight through the bass region, it also has fine agility and crisp timing. Bass guitars might lack a little authority, but they're also refreshingly free from tonal thickening or overhang. It's very easy to hear not only what notes a musician is playing, but how the phrases are constructed, and how the intentionality of one note leads on to the next. That lack of 'heaviness' is combined with an upper midband that's rather stronger than most, which has several consequences. The good news is that it makes for a very open sound with explicit detail through the voice band. This means that speech is very intelligible, even when playing the system at whisper-quiet levels, though the tonality does sound a little 'thin'. However, it also means that things can start to sound a little too aggressive when the volume is turned up high, depending on the quality of the source material and or ancillary components. We're inclined to speculate that while it's clearly true that the monocoque enclosure is very effective at avoiding generating low-frequency colorations, its very stiffness might have pushed them higher up into the midband. However, we should stress this is mere speculation, and proving it would require far more complex apparatus than was available. As one might anticipate from such a high-quality standmount, stereo imaging is to a very high standard. While temporal focus falls somewhat short of the ultra-tight timing achieved by the Green Mountain Rio, it's still very good, and there's absolutely no tendency for individual sounds to hang around the boxes. Furthermore, the Performance 2's superior neutrality ensures more believable image perspectives and better resolution of depth. The overall soundstage is impressively spacious and airy, and it's tempting to suggest this might well have something to do with the decorrelated treble output issuing from the back of the ATT tweeter. The Performance 2 is a class act, no question, though its somewhat light and bright character won't suit all tastes and systems. Indeed, one suspects that its larger floorstanding Performance partners will probably have more universal appeal and may well be amongst its strongest commercial rivals. That said, this speaker certainly delivers the beneficial lightness of touch, the airy, spacious imaging, and the entertaining agility that is to be expected from the combination of its standmount configuration and its advanced technical features.